I noticed that you guys dont have these here. So here ya go. They show all the possible places where the Uniques spawn. If they spawn, they do so at one of the dots. The authenticity of the Isy map is questionable. Last edited by nightbloom on Mon Aug 13, 2007 10:15 pm, edited 5 times in total. Wow.. theres like twice as many for Isy. I believe she got that from silkroadtavern, and I also believe that the creator admitted to making it up. Not sure. uh? an unique named easy? where is he? i go kill him fast !! They had me...Standing...right on Uri's spawn point...o.O Mean bastiges. Thanks for posting these night! I have seen all of these except for Isy, thank you for this. Does anybody have the spawns for Lord Karken or Saytan by any chance? The Isy one is wrong. If someone could save those pictures and put them in this thread that would be sweet . . .
"Every time history repeats itself, the price goes up." 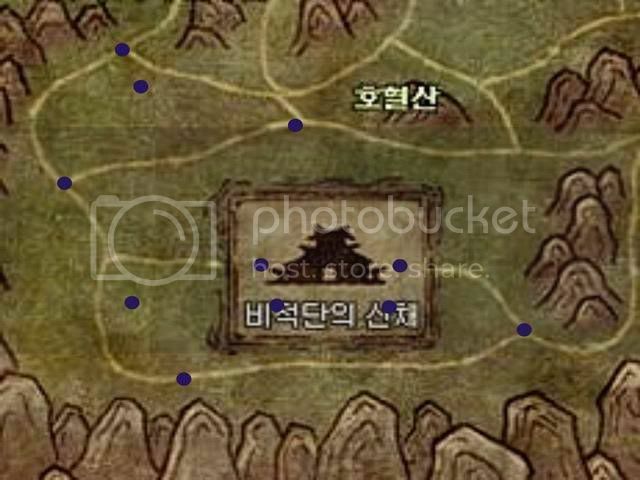 Is it possible for someone to make these maps in the English version? i can never find tigergrl when i look aroud the time i have checked 5 spots hes already defeated what can i do? so heh....r the map is bad or it was a bug! Nightbloom, could you use something like ImageShack? PhotoBucket doesnt really work on my computer for some reason..
anyone seen lord yarkan(dun noe if the spelling is right) before? or anyone killed him before? Or you're on a server where lots of people still hunt Ureuchi. Wzup with those naked chars? How do u actually do that? 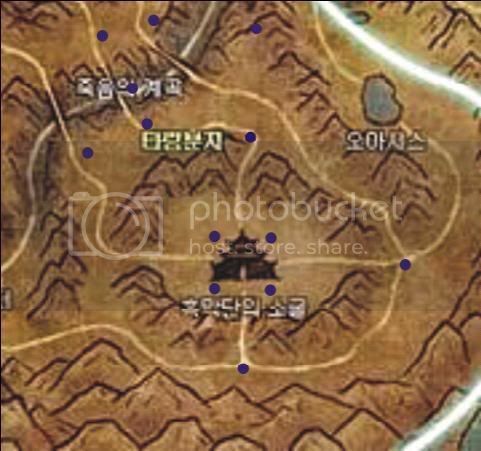 i saw an isy map b4 with more dense dots..
but i forgot where. it covers all the way to bunwang area/ferry.